Through its Patent pending product Ecrypt One, Bravatek provides data leak prevention and email security. 2: Telecom- Builds towers to suit the major carriers and utilities. A few years ago, BVTK acquired Viking Telecom, a small tower services company that builds and maintains telecommunications towers. Bravatek regularly signs up companies with promising security technologies as Marketing Alliance Partners. BVTK gets a significant percentage of any sales they help make for these companies through the MAP program. Though normally a much longer process, the Company was approved and placed—in one day—on SEWP government-wide contract with $20 B ceiling. Bravatek Solutions, Inc. (OTCPink: BVTK)), a next generation cyber security software, hardware and solutions provider, today announced that it has retained a nationally known sales executive, Mr. Jim Brown as a Vice President of Sales to coordinate sales activity, and oversee the installation of its nationwide sales organization. “These orders/commitments translate to a significant ROI for Bravatek from a recent $200 k investment in HelpComm. More work is expected into 2017, which could translate into an estimated $2 M+ in additional revenue for the Company”: commented Pauline Ewald, JD, VP of Telecom Services at the Company. Bravatek expands sales team to present Ecrypt One and its enhanced line of MAPs to 40 new prospects during recent Q4 sales blitz. Editorial comment: So the several meetings July 19 to close business with the U.S. government and military were successful? Don’t hold back, Tom. Tell us more! As of 10/30/17, BVTK remains current! It is an SEC filer, and is OTC Pink Current. Bravatek Technology’s management has the industry knowledge and entrepreneurial innovation to advance the company’s strong market position. They’re backed by a highly experienced, diverse and respected team of directors. "Held at DTC" number will be the closest number to the float. 03/28/19 - 1,363,315 (DTC 1,359,750) increase of 64,791 since last update. BVTK signs Joint Venture with ABHI. ABHI suspended by the SEC on Jan 17, 2018 for Delinquency. Dumped to Grey marked, and likely Revoked in near future. 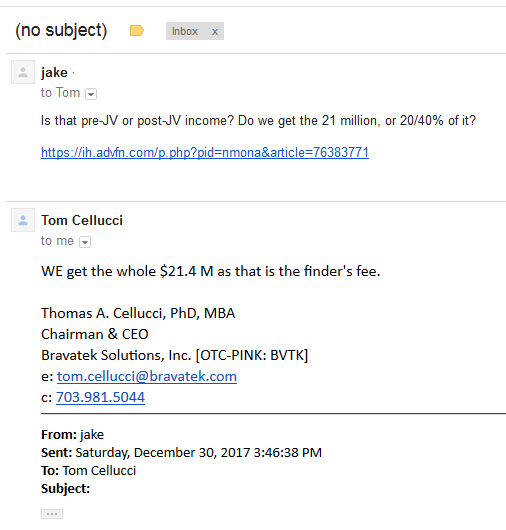 BVTK Involved in Money laundering?